The Declaration of Independence and the ensuing war with Britain were only the first steps in establishing a government for colonial America. Over 11 years passed from that fateful July fourth before a new document was formed that replaced the Articles of Confederation under which the colonies had united to fight the British forces and ensure their rights. The Constitution was a compromise between those who argued that survival depended upon a strong centralized government and those who feared the abuses that might result and wanted authority to remain with the states where government was closer to the people. Thus, the checks and balances that divide responsibility between the states and the national government were conceived. When, at last, the Constitution was written, all but, three of the delegates signed. Edmund Randolph and George Mason of Virginia, and Elbridge Gerry of Massachusetts refused because of reservations over specific provisions and omissions. However, this was only the beginning. The Articles of Confederation had relied solely on ratification by the state legislatures. 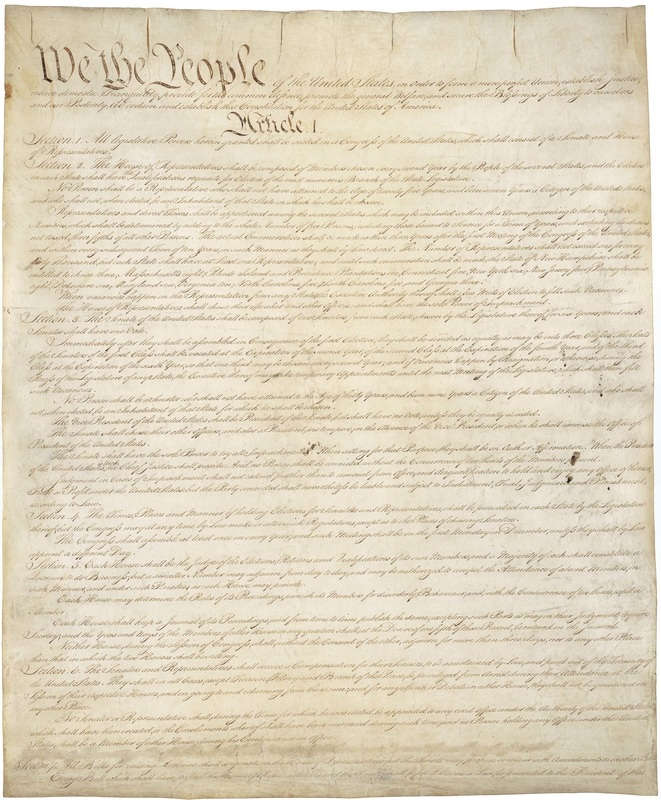 The framers of the Constitution, however, wanted to give substance to the Preamble's claim that the United States derived its authority from the people, not simply the states. Therefore, in order to become law, the Constitution first had to be approved by the citizens meeting in special conventions. The first state to ratify the Constitution was Delaware with a unanimous vote of 30-0. Pennsylvania, New Jersey, and Georgia quickly followed suit with New Jersey and Georgia also voting unanimously in favor of the Constitution. The delegates from Connecticut quickly moved to ratify the new document and establish the tenet by which the Federalists, the supporters of the Constitution, would operate. When, at last, the Constitution was written, all but, three of the delegates signed. During the Pennsylvania convention, the Federalists knew they carried a majority of the vote for ratification. The Anti-federalists, those opposed the new document, refused to attend, thus preventing a quorum and delaying the vote. A sergeant-at-arms was sent to hunt down the missing delegates. A mob found two of them first, and literally dragged them to the convention against their will. The maneuver outraged the Anti-federalists, who said that this proved the Constitution was a threat to personal liberties. The Connecticut convention relied on the reasoned speeches of the Federalists to gain support for the Constitution. Although forty Anti-federalists refused to sign, they left the convention reconciled to the outcome, a far cry from the Pennsylvania delegates. The next state to vote on the Constitution was Massachusetts. By this time the Anti-federalists had gained in strength and support. The battle in the next eight states would be hard won. To strengthen their position, several members of the Federalists wrote a series of articles and broadsides that offered a host of reasons why the Constitution deserved popular support. Among the authors were Alexander Hamilton, James Madison, and John Jay, who published eighty-five essays under the collected pen name "Publius." The articles were a point-by-point rebuttal of the main Anti-Federalist arguments and are known to us today as The Federalist Papers. Massachusetts, one of four states key to ratification, offered the first true test of the Constitution's popularity. They shared the traditional New England suspicion of central authority and harbored reservations about the Federalist party's dealings in the Shay's Rebellion, an uprising by the state's debtor farmers. It was also the largest convention and the most representative, with one delegate for every 1000 voters. Although the Anti-Federalists initially held the majority, the delegates from 46 of the 318 towns chose not to attend the convention. In addition, neither Samuel Adams nor John Hancock, both Anti-Federalists, took an active part in opposing the ratification. The move that turned the tide for the Federalists was the proposal that a series of recommended amendments be included. They realized that none of the remaining states would give unconditional support to the Constitution without some instrument to protect the rights of individuals. The Anti-Federalists made a series of miscalculations in the next convention. Confident of a quick defeat in Maryland, they failed to organize an effective campaign during the election for delegates and were badly beaten. They compounded their error by delaying their arrival at the convention, where they found themselves outmaneuvered by the Federalists in the first parliamentary rounds. As they shaped the role government would play, they created a sense of nationhood. The Federalists took advantage of the mistakes made by their opponents and won a straight victory. The remaining contests would require compromise by the Constitution's supporters and the use of amendments such as those employed in Massachusetts. South Carolina was the first of those states. The delegates voted in favor of ratification with a recommendation for four amendments to be added later. New Hampshire at last turned the Constitution into reality. Their ratification, with 12 recommended amendments, provided a clear majority of nine states. However, the Federalists weren't finished yet. They wanted a unanimous decision from all thirteen states. In addition, the remaining key states, Virginia and New York, had yet to vote. Without their support, the Constitution could still fail. In Virginia, a long, tiring contest was held between the two sides. Although the Anti-Federalists at first seemed to gain support, the lengthy, debates began to take their toll. Again the Federalists proposed a list of recommended amendments. The ratification of, the Constitution was no longer in question, merely whether or not the amendments should be in the form of recommendations, as the Federalists wanted, or would be binding conditions of ratification as the Anti-Federalists demanded. The arrival of the Virginia Attorney General, James Innes, proved the Federalists position. He eloquently argued that the Constitution's supporters would willingly back any amendments that did not violate the basic intent of the framers. With that, the vote was cast and the Constitution was ratified. News of Virginia's ratification reached the New York convention, the last key state, during the second week of their debates. It became vividly apparent that only New York, North Carolina, and tiny Rhode Island remained outside the Union. The Federalists altered their tactics and refused to participate in further debates. After voting in favor of ratification, the Federalists joined in a unanimous vote to send a circular letter to every state in the Union suggesting a second national convention to address the question of amendments to the Constitution. When the convention in North Carolina convened, the issue at question was not ratification of the Constitution but whether they would participate in the Union. With George Washington already chosen as President and knowing that James Madison was drafting a bill of rights, North Carolina at last voted in favor of the Constitution. Rhode Island remained the sole state which had not yet voted on the issue of the Constitution. It was also the closest of all votes. Providence, the largest economic center in the state, threatened to secede from the state if it did not ratify the Constitution. Newport, the other major port, would probably do the same. By a 34-32 vote, with three Anti-Federalists absenting themselves, the Constitution had finally won a consensus. It took nearly three years of hard work for the Constitution to pass all thirteen of the original colonies. 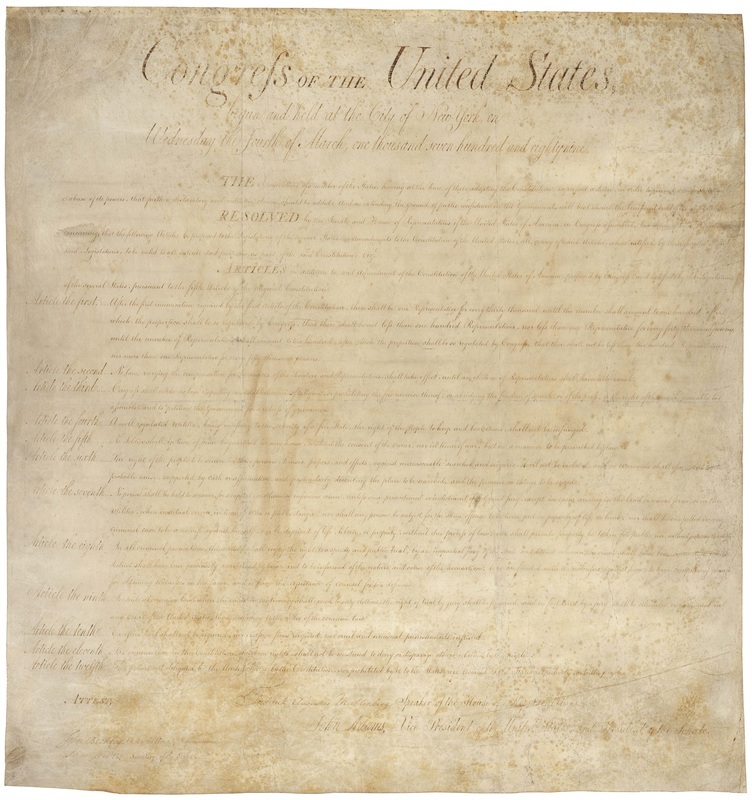 Before it was over, a Bill of Rights had been added as amendments to the original document. It took another year and a half before the final state, Virginia, passed the Bill or Rights and it became a part of the Constitution. At probably no other time in the nation's history have the citizens been so informed and been such an integral part of shaping the U.S. government. They knew and understood what their rights and responsibilities were under this novel form of government because they helped form it. As they shaped the role government would play, they created a sense of nationhood that would extend far beyond the boundaries of the first thirteen colonies.